Perhaps my most favorite hand-made earring! I was inspired to make these earrings when I found the brass finding. The finding comes in several metals (silver, gold and brass). I thought the brass would look the prettiest. The colors were chosen to match a shirt I had bought earlier that day. My goal is to have earrings to match every outfit in my closet. I love these crystal beads! They come in so many colors and are so sparkly and beautiful. Here is how I made these earrings using the Basic Loop technique taught in my Wire 1 tutorial. 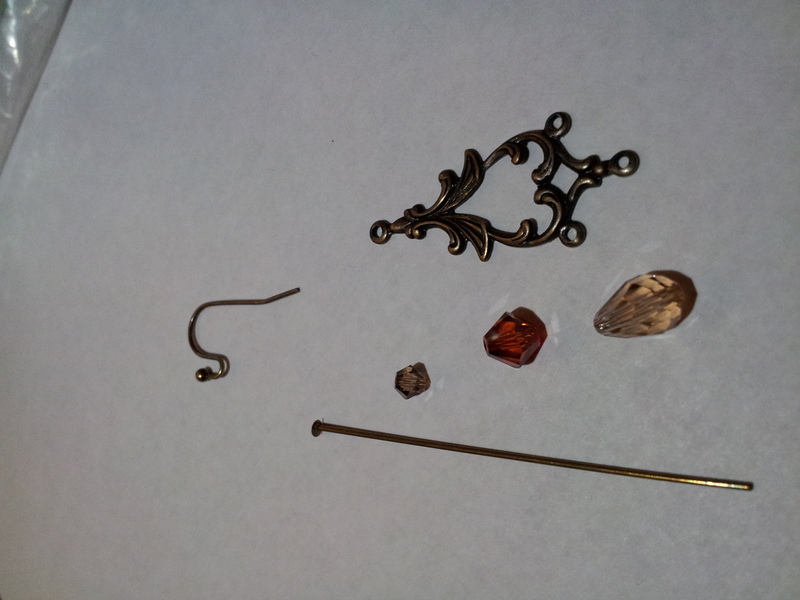 2 each brass chandelier findings - The number of crystal beads listed below are based on 3 loops on my finding. Adjust below quantities based on your finding. It is important to get center drilled beads in order to use the basic loop technique. The wire wrapped loop is learned in the Wire 2 Class, which I will be blogging about soon. Beadworld only has dead soft brass wire in bulk, which is too soft for our purpose (half hard is recommended). I decided to purchase a couple extra headpins and just cut off the head. I only purchased 8, but you may want to purchase some extras depending on how conservative you can be in salvaging the scrap metal. From this point forward, I am going to assume that you have read my Wire 1 - Basic Loop tutorial. This article teaches you how to make the basic loop, which is required to make a beaded headpin and double-beaded eyepin. Step 1: With the 6 tear drop shaped beads, make a beaded headpin with the head being on the fatter end and the eye on the skinnier end. Keep the excess material from the headpin to use for step 2 below. Step 2: With the 6 diamond shaped beads, make a double beaded eyepin. Before cutting the tail off the eyepins, string one end through the eye of the tear drop shaped beaded headpin from step 1 and string the other end through one of the bottom loops of the finding. Step 3: With the 2 smaller diamond shaped beads, make two double beaded eyepins. Most likely the eyes will need to be perpendicular to each other. See the larger picture below. I used a headpin with the head part ignored/cut off. Before cutting off the excess tails, string one end to the top loop of the finding and the other end to the earhook loop. 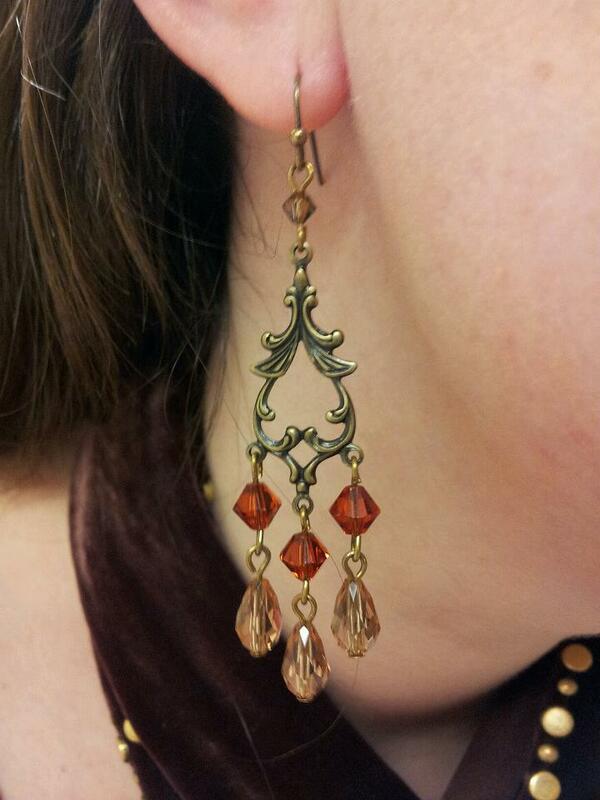 I love this earring and have gotten so many compliments on it. I had bought a rust red shirt with ivory lace. The beads on this earring match so perfectly. This project has inspired two new projects. I plan on making a crystal chandelier necklace to match these earrings. 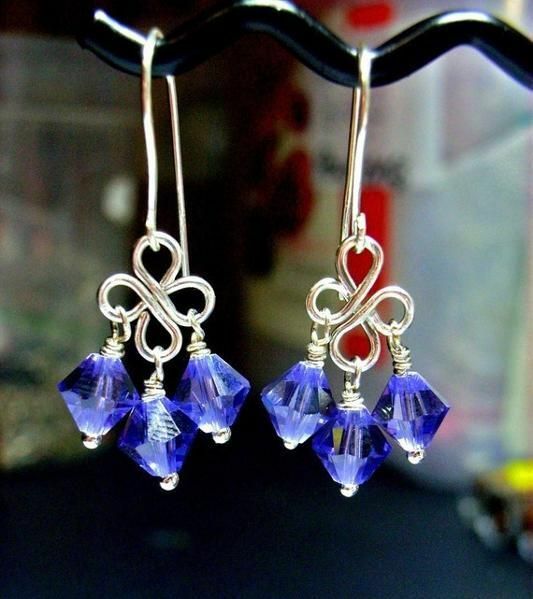 Secondly, I plan to make a second crystal chandelier earring with silver metal and light blue and teal crystals. I have a blue shirt and a teal shirt that need some matching earrings, so my goal is to match one bead to one shirt and the other bead to the second shirt. I will post pictures and instructions for both of theses projects later. My one annoyance with this earring is the earwire. I found that it is not shaped correctly and slips out of my ear. Luckily, I have recently taken the earwire class and can now make my own earwires! I'll be posting a tutorial soon. I used two 3" brass headpins to make my own earwire. Now they are perfect! Pictures above still show the old earwire. The key is to find a finding that inspires you. 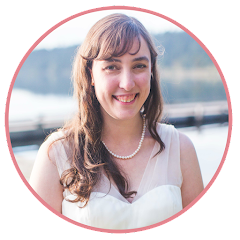 The below projects have slight variations, but using the basic loop and a center drilled bead, you can make them too! 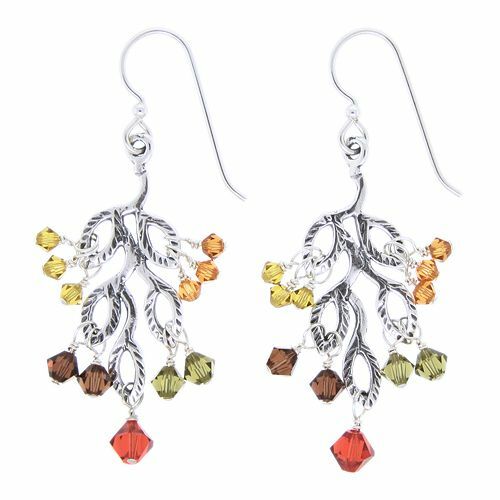 Autumn Leaves - Similar to my earring, this one takes a finding and adds crystal beads to the ends. 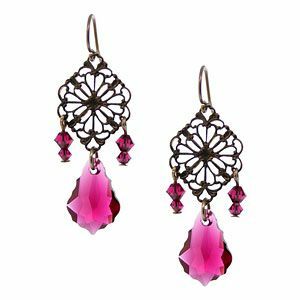 Brazen Brass Earrings - The side beads use the basic loop, while the middle bead is attached with an open jump ring. It could have been attached with the wire wrapped loop. Crystal Twist - The picture shows a wire wrapped connection, but you can simply substitute the basic loop. Don't forget to also check out my Pinterest page for more inspiration! I'm thinking this would be a great way to update thrift store finds!